Watch this exclusive Mr. Media interview with actor and comedian Jason Stuart, host of the podcast “Absolutely Jason Stuart” and star of the TV series “Mentor,” by clicking on the video player above! “Absolutely Jason Stuart” is a podcast hosted by comedic actor Jason Stuart and appears weekly on the TradioV network. So much has happened in the world since the first time comedian Jason Stuart was a guest on Mr. Media, back in June 2009. For one thing, he and I can now wed in at least 37 of these 50 states. For another, the big gay bear – his description, not mine – developed his own video podcast, “Absolutely Jason Stuart,” on the T-Radio-V network. And he’s got a web TV series, “Mentor,” co-starring Alexandra Paul (“Baywatch”). So he didn’t even need to come back here, but he did anyway. 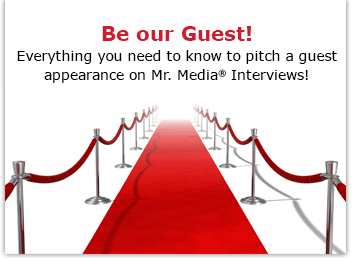 Mr. Media is recorded live before a studio audience full of comedians, gay and straight, all of whom are eyeing my guest’s package because that’s what they do … in the NEW new media capital of the world… St. Petersburg, Florida! And finally, he has become a much more familiar sight on TV and in movies, making appearances on “Sleepy Hollow,” “Maron,” “The Secret Life of the American Teenager,” “Entourage,” “Everybody Hates Chris” and “It’s Always Sunny in Philadelphia,” to name just a few. So why not get caught up?